Leading a truly balanced life. Our elders never fail to remind us to strike a good balance in life. Solid advice, if you ask us. But we never thought someone would take it quite literally, making a living out of the ability to balance the most random of items on top of each other. South Korean balancing extraordinaire, Byun Nam Seok or “Rocky”, as he is often called, has mastered the art of using gravity to his advantage to balance any object you can think of – and we mean anything. He’s been practising for the last nine years. His secret? End every balancing attempt with a snap of his fingers – or so he says. If you’re thinking along the lines of phones and books, right now, all we can say is: think bigger! Byun balances a teapot on the nose. 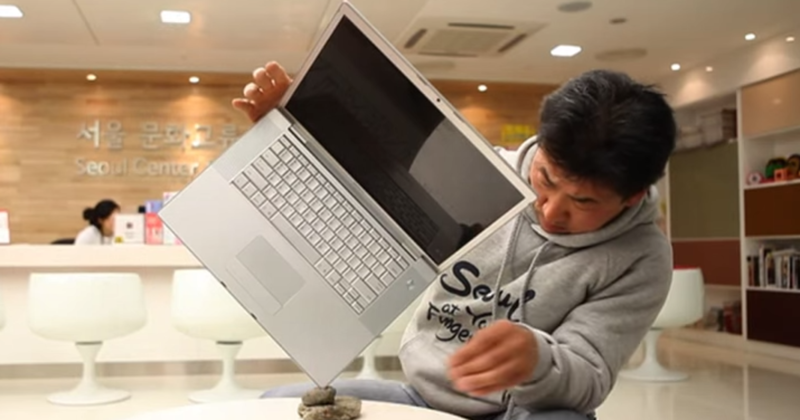 How about balancing a laptop and an iPhone on its edges? Fine, the iPhone didn’t last long, but that laptop’s still going strong though. Okay seriously, now he’s just showing off. His unique skill brings him around the world, captivating audiences everywhere from his home in Seoul to Abu Dhabi and the United States. And he was even featured on Fox News, what – or who! – he balances here is just phenomenal. Byun balances Fox 5’s Melanie Alnwick while she sits on a chair. For more photos, visit his Facebook page. Images sourced and text referenced from Koreaboo, A Plus and Fox DC News.